So what did I have? 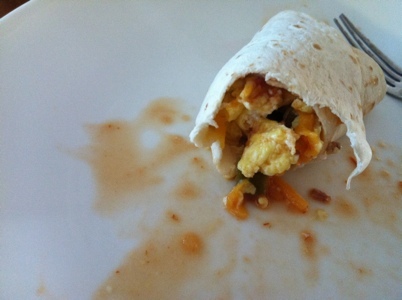 A glass of orange juice and a breakfast burrito. Sounds kinda lame, if I do say so myself. BUT, when you add bacon to anything, it’s an instant home run. FYI, it wasn’t in the OJ. It doesn’t sound like much but it’s filling and the salsa makes it really tasty! I get bored with diet/healthy food pretty easily so anything I can add salsa to is a win in my book. I thought I was really hungry a week or so ago and made 2 of these. HA! I got 2 bites into the second and about hurled. Anybody else have some great standby breakfast dishes? I’m always on the hunt.